The Department of Statistics — in keeping with the annual observance of Caribbean Statistics Day — is this week using the day to showcase the vital role of statistics in improving people’s daily lives. “Traditionally October 15 is the date observed for Caribbean Statistics Day, however due to the disruption of Hurricane Nicole, the Department of Statistics will highlight the day on October 28,” a spokesperson said. “The Department will be hosting a booth for residents who have not completed the census to sign up to be interviewed and/or to learn more about the Department of Statistics. The booth will be on the lower level of the Washington Mall from 12.00 – 2:00 p.m. this Friday [Oct. 28]. Bermuda’s statistics impact people directly or indirectly through the information provided about items such as food prices, expenditure patterns, housing, the health of the population and the job market. Official statistics can help decision makers develop informed policies aimed at improving people’s lives. Researchers depend on data provided by the Department of Statistics to write comprehensive reports. Economic data can point to emerging industries which can in turn result in investment in those industries. Trade statistics can help entrepreneurs decide the viability of a new business initiative by studying the quantity of imported products of interest. Residents’ participation in the annual Household Expenditure Survey has helped participants have a better understanding of budgeting for their household. The growing population of seniors highlights that future goods and services will be required to meet their needs. Employment statistics indicate occupations with a high number of non-Bermudian workers which can be taken into consideration by Bermudians when choosing fields of academic study. The Consumer Price Index data and the Gross Domestic Product for the healthcare sector can assist in monitoring the cost of healthcare. Online data collection was introduced during the 2007 Employment Survey and was also used in an earlier phase of the 2016 Population and Housing Census. 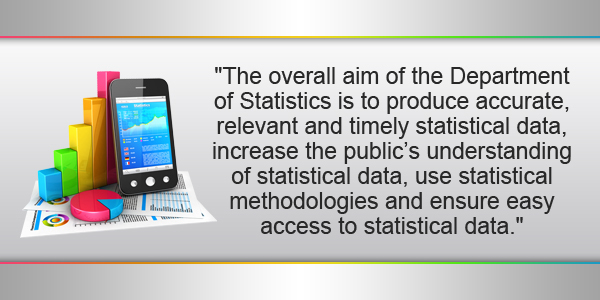 Director of Statistics, Melinda Williams said, “The overall aim of the Department of Statistics is to produce accurate, relevant and timely statistical data, increase the public’s understanding of statistical data, use statistical methodologies and ensure easy access to statistical data. For more info about the Department of Statistics or Caribbean Statistics Day visit here.